Since every pregnancy is different, it is possible that you may miss these early signs and symptoms. The only way to be sure that you are pregnant is to take a pregnancy test. Most of the symptoms appear before you realise that your period is late. However, this well-known sign of pregnancy may be misleading if your periods are irregular. After approximately a week of conceiving, the fertilised egg attaches itself to the wall of your uterus, which leads to spotting, cramping and sometimes even bleeding. This bleeding is known as implantation bleeding. The cramps and bleeding, however, are slight. Many women even notice a milky white discharge. This may stop after a few weeks or continue throughout the pregnancy but isn’t anything to be worried about unless it causes a burning and itching sensation, or has a foul smell. Moreover, if you bleed severely along with feelings of pain or lightheadedness, visit the doctor immediately as it can be a sign of ectopic pregnancy or miscarriage. Hormonal changes cause this sign of pregnancy and changes the way your breasts feel. The discomfort will likely decrease after a few weeks as your body adjusts to hormonal changes. Usually within the first week of conceiving, you may start feeling tired and sleepy. This might improve by the second trimester. It is thought that high levels of the progesterone hormone along with lower blood pressure and blood sugar levels may contribute to this particular symptom of pregnancy. Increased levels of hormones in early pregnancy may contribute to these symptoms. 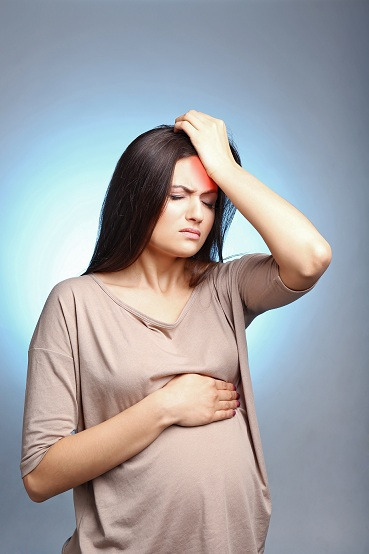 Some pregnant women experience slight nausea with or without vomiting. It usually sets in a month or so after getting pregnant but can occur earlier as well. The cause of this is not celar but is most likely because of hormonal changes. This is the most common sign of pregnancy. Despite its name, morning sickness can occur at any time of the day, but it’s more common in the morning. During this time, you can develop an aversion to or craving for certain food items. After conception, the increased hormone levels increase the blood volume and increase the rate at which urine is processed. The above list in no way is comprehensive, and the signs of pregnancy can vary for you, which is why it is good to consult an Obstetrician. This way you can be sure whether you’re pregnant or not and can also help you in the effective management of these common pregnancy symptoms.